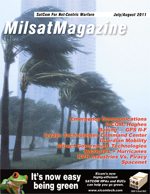 Sat Magazine was delighted to be able to chat with Jim Corry recently, regarding his companys mutual aid radio talkgroups. What exactly is this service? Called SMART (Satellite Mutual Aid Radio Talkgroup), Mobile Satellite Ventures nationwide push-to-talk satellite network allows law enforcement and public safety officials to participate in a nationwide, two-way satellite radio talkgroup. The network was conceived, and is administered in conjunction with, the U.S. Department of Justice (DOJ) and the Federal Bureau of Investigation. Officials are first authorized by DOJ to participate in the talkgroup. Group members can listen to, or join in, conversations taking place over the talkgroup by using MSVs push-to-talk satellite technology. The talkgroup is available without any additional cost of MSVs public safety customers. Mr. Corry is a 22-year veteran of the United States Secret Service, where, from 1976 to 1998, he held various positions of increasing responsibility, including leading teams of over 100 people and protection of senior U.S. leaders as well as the President and Vice President. In 2007, Mr. Corry was appointed to serve on the Joint Advisory Committee on Communications Capabilities of Emergency Medical and Public Health Care Facilities. Established by the National Telecommunications and Information Administration (NTIA) and the Federal Communications Commission (FCC), the committee assessed the capabilities and communications needs of medical and public health care facilities across the nation and submitted its report to the U.S. Congress. Good day, Jim, and thanks for taking the time to talk with us. The first question deals with the reasoning for MSV establish satellite mutual aid radio talkgroups? What drove this project? were doing something about it. What problems do satellite talkgroups address? Satellite talkgroups are immune to the congestion and destruction associated with terrestrial networks.They are a tool to solve, or overcome, interoperability problems. Why did MSV wish to establish emergency responder talkgroups? Talkgroups enable and improve the capabilities of multiple agencies at the federal, state, local levelsand even private agenciesto communicate better and to coordinate operations. What are the benefits and features of the MSVs SMART solution? Talkgroups can dramatically improve interoperable communications and have a profound impact on operational coordination and interoperability. MSVs unique push-to-talk dispatch-style service offers a private mode talkgroupallowing law enforcement, public safety, and emergency respondersto conduct interstate and interagency, one-to-one, push-to-talk operations with all other units throughout the region that have subscribed to the talkgroup. Additionally, the MSV service features a standard broadcast mode talkgroupemploying one-to-many, push-to-talk satellite technologyand provides a way for any member of the group to quickly communicate a message to the entire talkgroup. How has the implementation been going? Since our initial announcement of the Department of Justice SMART talkgroup last August, the interest and uptake in joining or forming talkgroups has been keen. We have assisted in the formation of two talkgroups for the Gulf Coast states of Louisiana, Texas, Alabama, Mississippi, and Florida. They are called GSMART. We recently announced the formation of two more talkgroupscalled MSMARTfor the Mid-Atlantic States, including Maryland, West Virginia, Delaware, Pennsylvania, Virginia, and the District of Columbia. As of February of this year, MSV now has more than 60 federal, state, and local government agencies around the nation participating in organized talkgroups using MSV services. They represent some 26 federal departments and agencies, 13 statewide organizations, and more than 25 county and city agencies. Our number of users has increased by almost 70 percent since November of 2007, which was when we developed our first talkgroup users report. Have there been any comments from those in the groups? Using MSVs satellite equipment and communications services, we are now able to coordinate police, fire and rescue equipment, plan medical contingencies, and quickly prioritize and move food, water, and shelter supplies to the critical areas, said Randy J. Johnson, the assistant manager of communications for Plaquemines Parish, Louisiana. Lets take a look at a case study that involved MSV helping southern Louisiana prepare for emergency response. In 2005, hurricanes Katrina and Rita devastated the Gulf Coast states of Alabama, Mississippi, Louisiana, and Texas. Federal, state, and local emergency responders were overwhelmed by the magnitude of the devastation and destruction. The local communications infrastructure was destroyed, crippling organizations ability to command, control, and communicate with their responders in the field. The loss of communications exacerbated the life-threatening situation throughout the region. At the outset of the 2007 hurricane season, the City of New Orleans, along with public safety and emergency response organizations of Jefferson, Plaquemines, and St. Bernard parishes, took part in Operation Swift Response, a Department of Homeland Security-sponsored event. The scenario included a category three, Katrina-like hurricane emergency. Federal, state, and local agencies all took part in the 10-day training and exercise. Plaquemines Parish, Louisiana was one of the hardest-hit areas and took much of the brunt of Katrina. After the 2005 hurricanes, Plaquemines Parish began looking for a communications solution its emergency personnel could depend on if another disaster struck. At the outset of Operation Swift Response, the parish found that solution in Mobile Satellite Ventures (MSV) push-to-talk satellite phones. Plaquemines response team established its command center in the parishs Emergency Operations Center (EOC) in Belle Chasse, Louisiana. Throughout the exercise, the Plaquemines Parish EOC was able to communicate to its mobile field unit via MSV push-to-talk satellite phones. The MSV satellite radio/telephones and service enabled the Plaquemines Parish EOC to maintain interoperable communications throughout the parish, with the surrounding parishes, and the state of Louisiana EOC. For Operation Swift Response, an MSV satellite radio/telephone Go Kit was installed in the 911 communications center and another with the mobile assessment team in a roving command vehicle. The mobile command vehicle toured the parish, stopping at some of the areas that were hit the hardest by the 2005 hurricanes  locations most likely to need immediate rescue and response assistance in the event of similar storms. Even with electricity out, and wireline and cellular phone service disabled, command and control communications continued uninterrupted over satellite. During Hurricane Katrina, this parish had to evacuate their 911 center, leaving their installed satellite communications behind. By installing their MSV MSAT G2 as a go-kit in their 911 center, the parish is now able to take their satellite communications with them should they ever have to abandon the 911 center in the future. Plaquemines Parish also recognized the need for satellite equipment training. Prior to this exercise, the parish used MSV personnel to instruct critical personnel how to use the equipment. MSV assisted the parish in establishing a Government Emergency Telecommunications Service (GETS) account with the Department of Homeland Securitys National Communications System. Senior executives within the parish now carry GETS calling cards. At MSVs advice, the parish is also exploring implementation of Wireless Priority Service on its cell phones and Telecommunications Service Prioritization (TSP) on critical wireline circuits throughout the parish. Using MSVs satellite equipment and communications services, we are now able to coordinate police, fire and rescue equipment, plan medical contingencies, and quickly prioritize and move food, water, and shelter supplies to the critical areas, Johnson commented. By using MSVs satellite communications technology in the future, we will be better able to communicate from our EOC to the field operators and respond to the needs of our community. Plaquemines Parish has a new Director of Homeland Security and Emergency Preparedness on board, and one of his first orders of business will be to acquire more satellite phones and expand our satellite communications capabilities, Johnson noted.